The day had started dark and wet. Heavy rain was showing no sign of easing and, for a split second, the thought of not going crossed my mind. The girls were grumping and a social gathering the night before had been a bit too enjoyable meaning we were running behind schedule but I then thought of the buses that I knew were coming up the A9 and decided that they had no choice about attending in the rain so why should I have it any easier. Thankfully by mid morning it had eased and Inverness was reporting brilliant sunshine once again. The bus was surprisingly busy when it arrived and there seemed to be a lot of blue on the go. I sat down behind a family wearing blue baseball caps and I wondered idly whether there was any signiﬁcance to their choice of headwear before I spotted their kilts and the “Bairns not Bombs” jumper the boy was wearing and also the ukulele adorned with the Saltire that he held. The tips of my Saltires were poking out the top of my bag and it was only seconds before I heard “Are you going to the March? Do you need any badges or ﬂags?” Before long other people on the bus were asking whether they could have a badge as well and it transpired that the young boy with the jumper was the same young boy whose photo was on the Bairns not Bombs leaﬂet back in 2014. A happy accident with the washing machine had stretched the jumper making it last for several more years! As we neared Inverness the Kessock bridge was at a standstill with traﬃc and I wasn’t sure whether I was imaging that there seemed to be more Yes stickers visible on vehicles than normal. We turned the corner towards the bus station and crossing the road in front of us were two people both carrying large Saltires. Entering the bus station itself, I spotted another family with Saltires poking out of a rucksack and then a further group also with ﬂags. Walking through the city centre, every second person seemed to have on a Yes badge or t-shirt or carried a ﬂag and I began to feel very heartened. The girls were hungry so we headed for food ﬁrst. Upon turning into Eastgate the sight that greeted us of people carrying Saltires was incredible and I realised just how big today was going to be. I said a quick hello to Kevin, Claire and baby Ariana – 9 months old and a veteran of these marches already, I know that hers will be a name we hear a lot of in future years – before receiving a text to say that some of the Wickers were waiting at Eden Court. We headed down, three of many people all making the same journey together with everyone marvelling at the attendance. 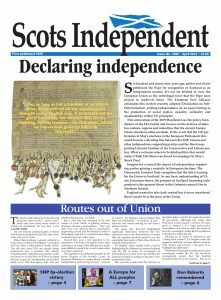 Margaret and Ian were on hand with the Scots Independent ﬂiers and, as the gatherers began to thicken, many familiar faces passed, whether from Facebook proﬁle pictures or previous gatherings, every one of them smiling. The Northern Meeting park soon ﬁlled with people and it was apparent that the original setup wouldn’t work as there were too many people and the procession began to snake through the middle of the park as well. Many areas had their own banners and we joined up with Yes Ross and Sutherland and Ullapooland Lochbroom. Flags from many nations were ﬂying, immediately behind us were the Brains with their New Zealand ﬂag and I spotted at least 3 Caithness ﬂags at various points in the park which was a wonderful sight for me! As the March moved oﬀ through the streets, it was incredible to see a sea of Saltires stretching in front of you as far as you could see and beyond; I estimated us to be in the ﬁrst quarter and so we would never see the end of the line. Spectators lined the streets, some supporters, some visitors and some were being pulled out of the line for photographs with tourists. Traﬃc had obviously been stopped for the March and as we neared the Town House, we realised that there was a very small counter demonstration going on. Unfortunately for the gentleman with the loudspeaker, the Bikers for Yes rally that was going counter clockwise to us was coincidentally stopped right beside them and every time he attempted to speak, he was drowned out by the revving of engines. As we began to leave the city centre behind us and head towards the suburbs, I felt slightly disappointed that the impact we would have would diminish however the queues of traﬃc still stretched ahead and once that thinned out, I realised that not everyone cheering us on were fellow walkers. The young boy playing the pipes, the wee girl actually jumping for joy, the lady in the wheelchair, the people with bowls of water for the dogs – these were residents standing outside their houses – thank you all for your support. The route was just over 2 miles and took us to what used to be the ﬁeld that adjoined my back garden, now an unrecognisable leafy park, my old house no longer visible with the bushes and trees that have grown. The walk took about an hour and a half and we were tired by the end yet I am humbled by those who undertook it with their own health issues. There were many, many there, one of them Philip from our own branch. Another was Zoe, the young daughter of another branch member. Philip has a chronic lung condition and has spent a great deal of time in hospital recently but he was there and he completed the March, possibly the last person into Castle Heather Park. Zoe battles her own serious health issues and the eﬀort that it must have taken you both cannot be underestimated. Philip and Zoe, people like you are an inspiration to all of us to continue to push for a better nation than what we currently live in. As we left the rally that was about to begin, I asked a policeman if he had any idea about the number of attendees. I had personally hoped for about 10,000 and suspected that it would be close to that ﬁgure. He replied that they didn’t have an oﬃcial ﬁgure yet but that it was in the 10-15,000 range; shortly after that the oﬃcial ﬁgure of 14,000 was given. Another marcher commented to another policeman that it had been a lovely afternoon with no trouble to which he responded that they hadn’t expected anything else. Police Scotland are to be thanked for their welcoming manner that day and their assistance. Hopefully, the 2019 Inverness March can have a more city centred route and I fully expect the number of marchers to rise signiﬁcantly as many more make a weekend of it. The distinct lack of yellow and black SNP colouring also added weight to the argument that Independence is not only SNP, this March really was for anyone. Although the mood of everyone around was buoyant and happy, what struck me most was the air of optimism. It’s hard to explain but something happened on Saturday, the mood shifted and 14000 galvanised marchers will take that feeling home with them and spread it. Previous Post: Are you listening Jock?